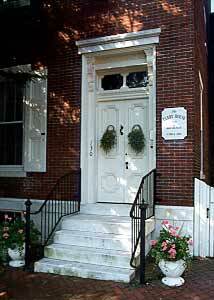 The Terry House Bed and Breakfast, New Castle, DE. 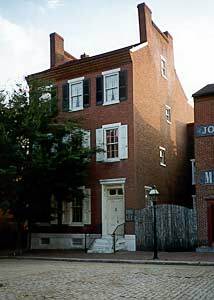 is a Federal Townhouse, circa 1860.
the city of Wilmington approximately 10 minutes away. 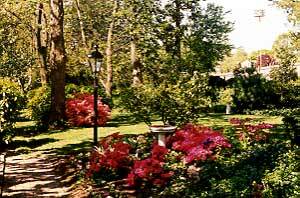 The Terry House Bed and Breakfast gardens adjoin Battery Park on the Delaware River. Our guest rooms are spacious, with private baths, queen size beds and modern amenities. The rooms offer a view of Battery Park or Market Square and the Court House and the Delaware River during the winter months. The Terry House Bed and Breakfast porches look out over Battery Park and the Delaware River and are the perfect spot to relax after a day of shopping, sightseeing, or special events in New Castle. or if you are relocating to the Wilmington Area.